Once, the city of Bulikov, the Seat of the World, was ruled by the powers of six gods, Divinities of unique and diverse abilities. With the guidance of the Divinities, Bulikov is able to dominate other countries, including the distant country of Saypuri, which has no Divinities of its own. Yet, a Saypuri named Kaj is able to kill the Bulikov Divinities, and free his people using a mysterious new weapon. The act that frees Saypuri causes mass destruction in Bulikov as the powers of the Divinities, which supported the city, vanishes. Whole portions of the city disappear, and parts are re-imagined in a catastrophe known as the Blink. The city lies in ruin, its people in desperate need of help. And the Saypuri, now free, offer help. But their help means that the citizens of Bulikov must forget their history and forget their gods. And while the city is rebuilt, it is a poor imitation of what it was. The people are poor, the city without much hope. Then, a Saypuri historian is killed. Murdered. Enter Saypuri agent Shara and her secretary, Sigrud. They are in Bulikov to solve the murder of one of their own, but they find that the death may only be a symptom of a deeper problem. The Divinities may not all be dead, it seems, and the citizens of Bulikov might not be so powerless as they appear. Soon, Shara and Sigrud find that the search for a murderer sets them on a course that may mean life or death for both the peoples of Bulikov and the citizens of Saypuri. 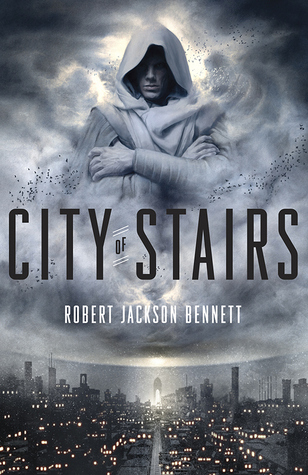 Robert Jackson Bennett has provided one of the most richly imagined fantasy worlds I’ve encountered in a long while. The ruined city of Bolikov is overflowing with mystery and tragedy, with glimpses of altered realities visible from the corner of ones eye. Shara and Sigrud are vivid, wonderful characters. And while I won’t give away any of the plot, I urge you to make sure you get past the first scene in the book, which opens during a legal hearing. I almost put the book down at this point in the story, but I’m very glad I didn’t. And Mr. Bennett? Shara and Sigrud are such fabulous characters, I would love to see a sequel.